We would agree with the authors that there are two options in terms of surgery for chronic pancreatitis – vis. 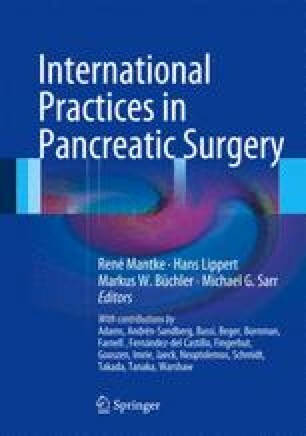 Resection or drainage procedures, however, most of our patients presenting with symptomatic chronic pancreatitis and requiring operative therapy do so with parenchymal disease rather than predominantly main duct obstruction, and, therefore, resection is the mainstay of our practice in the operative management of chronic pancreatitis. Drainage procedures are confined largely to drainage of pancreatic pseudocysts with a Roux-en-Y pseudocyst-jejunostomy. We prefer this option to pseudocyst-gastrostomy in order to minimise the influx of gastric content into the pseudocyst cavity. In many cases, patients present with enlargement of the pancreatic head simulating neoplasia and, therefore, are treated as we would for any suspicious pancreatic head mass and undergo a pancreatoduodenectomy. As many as 20 % of patients undergoing pancreatoduodenectomy for a pancreatic head mass prove subsequently to have chronic pancreatitis or intraductal papillary mucinous neoplasms on histologic examination of the specimen.